Hi and congratulations on the book. It takes a tremendous amount of hard work. Does it have any screen shots of some pages within the book? I see that amazon only has photo of the cover. Thank you. That was a very good suggestion and a few others told me the same : it's a pity there's no visual of the presentation inside. I reported the idea to the publisher who added 2 more photos. I wonder do you have any dolls by Eli Effenberger in there? (Marmite Sue/Menagerie) in there? I started my project before to discover these posts here. That's funny to see that several persons can have the same idea quite at the same moment. I have written a book about BJD art dolls. I needed two years to complete the whole project, find a publisher and see the book published. It was long and sometimes difficult, but the book is there. For the first time, more than 40 artists among the biggest names are gathered in this book : Marina Bychkova (Enchanted Doll); sisters Popovy; Elena Akimova ; Oxana Geets (Bardo Research) ; Olga Good ; Alina Ivanova ; Anna Kucherenko ; Natalia Lituta (Ingenue Dolls) ; Lillycat Cerisedolls ; Natalia Loseva ; Irina Lumiere ; Lutsenko ; Polina Myalovskaya (Vividdolls) ; Rafael Nuri (BiDoll) ; Forgotten Hearts ; Mari Shimizu ; Maryna Skubenko ; Tatiana Tofaneto (DollEssence) ; Tatyana Trifonova ; Lene Villadsen ; Sabine Vogel ; Dorote Zaukaite and many others. I hope this book will meet your expectations. I took a lot of pleasure to work on it and I am happy to see the result. My intention was to do the first book dedicated only to BJD made by artists. And as I interacted with artists all over the world, it seemed natural to write a bilingual book, french/english. I named it "The art of BJD - The first guide for collectors" - Publisher Les Presses Littéraires - 318 pages. I would be grateful to know what you think about it. So thank you for any comment. And good reading. Marmite Sue was contacted to participate of course. She began to accept but finally I had to renounce to include her in the book. Without getting into details, she had too many requirements which were difficult to manage. I understood that this collective project did not suit her. It's not easy to gather so many artists. An artist needs to find his place. All the others, Olga Good included, were enthusiastic and participated with pleasure. Oh darn, that is too bad, she is my favorite. I've always wanted her to do a book... I hope she does one day. Well, maybe she will do her own book as Marina Bychkova did. Or she could accept to participate if there's a second revised edition one day. Congrats on your book natcorti ! I just discovered it on DoA and bought my copy from the publisher I love doll books and I will be thrilled to add yours to my shelf. Talking about doll books... years ago I spent a lot of time working on a book about a particular vintage Italian doll, doing research, trying to interview people and find the missing info, etc. it was so hard. In the end, the project was left hanging as life got in the way. So, I really do appreciate people who can see it through and finally have their book done and published! So, congrats!! Thank you for your nice message Toletta ! I would like to know on what kind of particular Italian doll you worked. Was it on Lenci dolls ? I guess you are maybe Italian. I love Italy, I have my origins there. Please let me know what you think about the book when you'll get it. You are lucky : as you were among the first to order it, you had a low shipping cost which will no longer apply because the Post office changed the postal rates.. Yes, I'm Italian The doll is Corinne by Italocremona, a 14" plastic/vinyl fashion doll manufactured from the late 60s to the early 80s (but mostly in the 70s). I still love her dearly... she was my gateway (drug?!? LOL) to larger dolls, as before her I was mostly into Blythe. 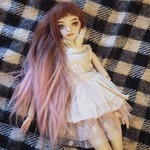 There's a group dedicated to Corinne dolls on Flickr if you want to check them out! If I can help you, I will do it with pleasure although I am not a professional. I will wait with impatience your comments. Thank you very much.